There are several Hong Kong food districts that people love to go because of the wide varieties of cuisines and numbers of restaurants. Ok, you may wonder that you can find great dining places in Causeway Bay, Central and Admiralty in Hong Kong Island, Tsim Sha Tsui, Kowloon Tong and Mongkok in the Kowloon Peninsula. So, what is the catch? 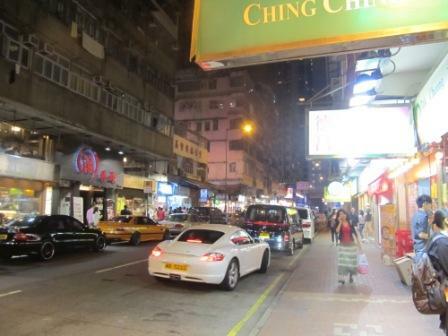 The big difference is that restaurants are next to each other in a Hong Kong food district. On the other hand, restaurants in the popular shopping areas are in clusters. 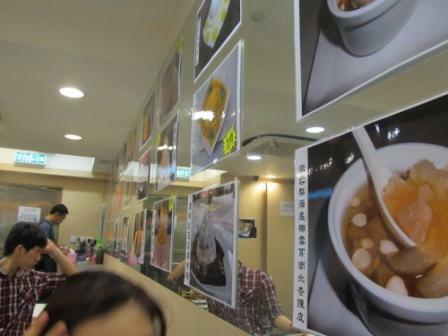 Here are several great Hong Kong food districts: Tin Hau, Tai Hang, Soho and Kowloon City. I will share my experiences with you. Note: there are several areas well-known of serving Hong Kong seafood (coming soon - link to Hong Kong Seafood page) that I will not cover here. It is about 15 minutes walk away from Hong Kong City Garden Hotel and MTR accessible. You can get pretty much all kinds of cuisine you can think of, such as Japanese, Korean, Dim Sum, Indian (coming soon - link to Hong Kong Indian Food page), Thai, Vietnamese (coming soon - HK Vietnamese Food page), Taiwanese (coming soon - Hong Kong Taiwanese Food page), Hong Kong domestic food (coming soon - Hong Kong Domestic Food page), dessert and so forth. I love it so much that I told my sister once, "I don't mind to come over here every night to try out different things if I could." Of course, she thought I was crazy. When we were there, some restaurants just open for business at around 7pm. I know the question you are going to ask. Yes, they all open very late, at least until 11pm. Some would be later. A few of them open for lunch. Most of the restaurants here charge super reasonable or low price. This is a relatively new Hong Kong food district. Nonetheless, my first impression was not as great as I had with Tin Hau. Instead of a straight road and occasionally a minor road of restaurants, this Hong Kong food district is made up of several side roads or alleys with 5-6 restaurants in each alley. In other words, you got to turn several corners to find out exactly what is in for you. We were there around 7pm which supposed to start busy. Crowds in restaurants are very extreme. One could be packed and the one next door was almost empty. Comparatively speaking, varieties of cuisine might not be as many as in Tin Hau. These 2 districts are about 15 minutes walk away from each other. They do have their uniqueness. While we were here in this Hong Kong food district, we went to a Vietnamese restaurant (coming soon - link to Hong Kong Vietnamese food page) to have dinner. 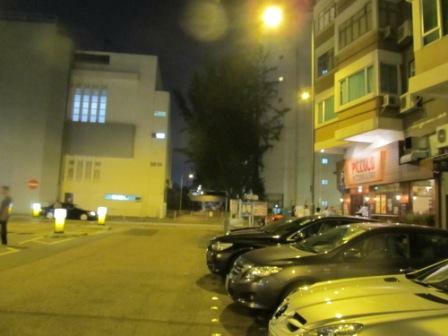 That restaurant located on the street where the Mid-Autumn Festival fire dragon dance is. Right across from that street, it is Ming tunnel which is part of the expanded path of the fire dragon dance. 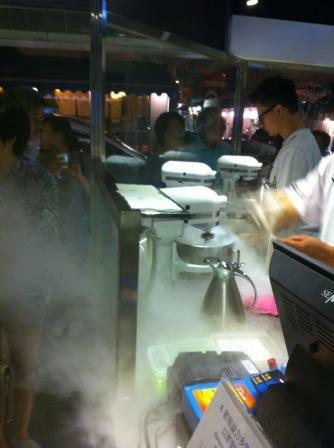 Right after dinner, we went to a place made fresh ice-cream with liquid hydrogen . There were only 4 flavors to pick. They change flavors every other weeks. It was pretty cool to watch them making ice-cream from scratch right in front of you. And within less than 5 minutes, you can try the freshly made ice-cream. How cool is that, huh? Since it was pre-Halloween (coming soon - link to Hong Kong Halloween page) season, ice-cream flavors and design went with the theme which was the chocolate and strawberry cheesecake flavor. The strawberry sauce represented blood. A piece of chocolate in a tombstone-liked design was on top of the ice-cream. They even had Bailey flavor ice-cream. Since Hong Kong people love changes and new things so much that I would doubt this store exists more than 2 years. Price range in this area is low to medium which depends on the restaurants you pick. Yep, electric mixer is a main tool for them to make fresh ice-cream with liquid hydrogen. Cool, huh? I was like a little kid looking through the window and see how it is done. You can tell that it is a bit difficult though. 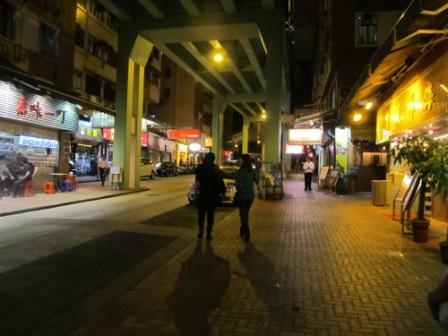 This area is the forerunner of Hong Kong food district. I L.O.V.E. this place. During my 10 years of part-time teaching career in Hong Kong, I passed by this area literally every day. Of course, being a foodie, how would I not step into several of them to try out. The uniqueness of this Hong Kong food district is that there are quite a few restaurants not serving mainstream cuisine. Most of them target for high-end customers. Some of them were so reputable that they eventually became mainstream in the Hong Kong food culture. Here are some cuisines that you can only find here, such as Northeastern Chinese food, Russian and Nepal. The layout of Soho is mainly built along the Central Escalator (coming soon - link to Central Escalator Hong Kong page), the world's longest escalator. Next to Soho, it's Lang Kwai Fong where there are many great pubs and bars for happy hours. If you love Chinese antique and/or want to burn some money, whatever reasons you have, this is a great place for Hong Kong antique shopping (coming soon - Hong Kong Antique Shopping page) as well. The price range of Soho's resstaurants ranges from low, medium and high. This Hong Kong food district is known because of the wall city and the old Hong Kong Airport (coming soon - link to Hong Kong Old Airport page) which became the current Kai Tak Cruise Terminal (coming soon - link to Kai Tak Cruise Terminal page). It used to be the bed of crime. After tearing down the wall city, environment and crime rate improved and gradually turn into a food district. Kowloon City is very famous of its Thai food because of the population here. There are quite a lot of mom and pop stores selling authentic Thai ingredients. Therefore, it is not surprising to have more Thai restaurants here in this Hong Kong food district. Last 2 times when we were here, we tried out several things. Of course, we went to a Thai restaurant which served awesome food although it took a while to wait for a table. But it was soooo...worth it. Right after the dinner, we went to the one next door and bought a few Mongolian beef buns for take-out, just to tried how it tasted like. Had we not had our dinner before that, we could have authentic Mongolian (coming soon - link to Hong Kong Mongolian food page) for dinner that night. Another time when we came here, we had the Hong Kong style home cooked meal. The restaurant is located on the rooftop of the building. No air conditioning at all. The dishes were the traditional home style Chinese food that people in my grandparents generation used to cook at home. However, due to the busy lifestyles of Hong Kong people nowadays, most of them rarely have time to do so. Also, some of them are no longer popular because of the health consciousness. The food was awesome. After dinner, we went to a mom and pop store which purely serves desserts. It is the Chinese fusion style. I had the mango coconut noodle bowl. I know you may wonder if it was a typo or your eyes got problems. Haha....none of the above. It was the traditional wide Chinese white noodles served in a bowl of cold mango and coconut juice. I got to say that the texture is different. But it didn't taste bad at all. Hong Kong people love to eat. Restaurants are everywhere. In my opinion, Hong Kong food districts make the busy lifestyles in this city much, much easier. Think about stepping into a food district and head over to your destination restaurant, it was packed with people. It is very easy for you to say, "Ok, if we can't get our table within a certain period of time, we can go over to so and so restaurant next door." Instead of getting frustrated standing there waiting, you can make a quick decision. I love food district. You go to the place that you are familiar with and always find something different to try. No matter if you are a foodie or not, I can guarantee that you will find something in one of these Hong Kong food districts that you will enjoy. Here are just a few I covered. There are more food districts in Hong Kong. Check back later for more update. For more simple recipes inspired by the Hong Kong food district, click here.